Somewhere in May 1952, Elvis Presley, shopped at Lansky Brothers, a Memphis men clothing store, officially named Lansky's Clothing Emporium, located at 126-128 Beale Street, established in 1949 by Bernard and Guy Lansky as an Army surplus store. Lanky's specialized in loud clothing, i.e. yellow suits, pink sport coats, and white shoes. The store catered mainly to black patrons, including Rufus Thomas and Junior Parker. Later, Elvis Presley bought clothing from Lanky's for many years. Many of the Sun recording artists - Sonny Burgess, Billy Lee Riley, Charlie Feathers, Roy Orbison, Bill Justis, and brothers Johnny and Dorsey Burnette - also bought their clothes at Lanky's. Elvis Presley's favorite colours where pink and black. Lanky Brothers provided the suits for both Elvis' and Vernon Presley's pallbearers at each one's funeral. Among other things, the Lansky brothers owned their own Memphis record label for a while, Peak Records. In 1956 Elvis Presley traded Bernard Lansky his Messerschmidt automobile for new clothing. "He came down and looked through the windows before he had any money, we knew him strictly by face", recalled Guy Lansky. "He was working at the theater at that time, holes in his shoes and socks, real shabbily dressed, but he stood out, his hair, sure, but it was his... what I'm trying to say, it was his, you know, manners. He was just a very nice person". LANSKY BROTHERS UNIFORM SHOP/MISSISSIPPI RIVER CAFE/BLUE LIGHT PHOTOGRAPHY STUDIO (NOW NAMED HARD ROCK CAFE MEMPHIS) - Before 1890. Located at 126-128/130 Beale Street, tel, 901/525-3655, across Second Avenue, Lansky's Clothing Emporium outfitted the best of Memphis' musicians, including Rufus Thomas, Junior Parker, Sonny Burgess, Roy Orbison, B.B. King, Bobby "Blue" Bland, Rufus Thomas, and others. 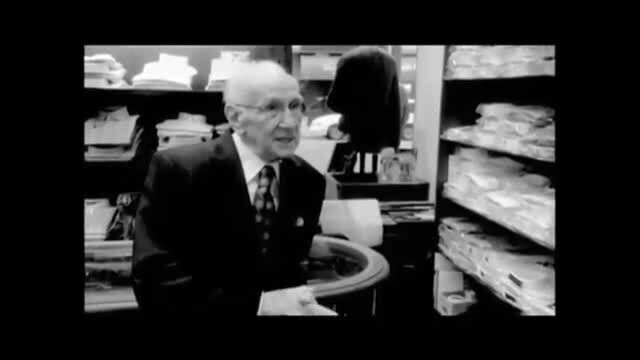 In 1946 Samuel Lansky bought and opened a shop for his two sons, Bernard and Guy, at 126 Beale Street, originally a store which sold leftover Army supplies from World War II, Bernard took advantage of the elevating Beale Street music scene and looked to provide clothing for the typical characters of Beale who wanted to dress dapper. 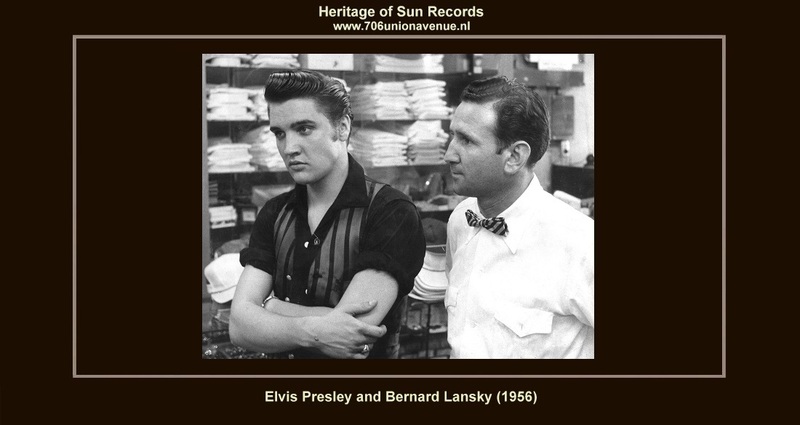 Elvis Presley first shopped at Lansky's in May 1952, when he was still in high school. Many items from his "loud" wardrobe were purchased at Lansky's. He continued to shop here throughout his life. Upon Elvis' death, Lansky's supplied his pallbearers with suits. Lansky gave Rufus Thomas free suits for advertising his store. When Rufus appeared on the stage of the Handy Theater, he opened his coat and shouted, "Ain't I'm clean? You know who makes me clean?". The audience screamed back, "Lansky Brothers!". Although this building currently has a single address, 130 Beale Street, it originally consisted of three separate stores. Between 1900 and World war II, 126-128 Beale Street contained secondhand clothing, furniture, restaurant, and shoe repair businesses. Beginning as a uniform store in 1946. The building which housed Lansky's has undergone numerous changes. When Elvis Presley had his first publicity photo taken, the Blue Light Studio was part of the Lansky building. In 1942 the Blue Light Photography Studio entrance was located at the corner of 130 Beale Street and Second Street. In January 1956, just before Elvis Presley first television appearance on Stage Show, he had a professional portrait made there. It was not his first portrait, if you count the unflattering photograph taken by a Memphis Press-Scimitar photographer just before his appearance at the opening of the Lamar- Airways Shopping Center. Elvis Presley trusted the Blue Light Studio because he had passed by the shop and looked at the pictures on display for years. On this particular day, Mrs. Margaret Sutton took Elvis' photograph. In the early 1960s, it became part of Lansky Brothers Big and Tall Men's Shop. The fate of the Lansky building is uncertain, eventually it may reopen as a book and record shop in music history as the Center for Southern Folklore (Phone 901-525-3655, Fax 901-525-3945. Documents the people and traditions of the South with films and exhibits plus Memphis music, books, arts, and crafts. Beale Street and Delta Region tours also offered. Distinctive gift-shop. Memphis musicians perform in an engaging smoke-free performance space. Coffee bar. Admission is free. Contributions of $2 for adults and $1 for seniors suggested. Inquire for charges for guide tours). Although it deals with all aspects of Southern culture, this museum provides the best in-depth background to Delta blues and rockabilly in Memphis. Special exhibitions change regularly, and the walls are always covered with archive photos, obscure record sleeves, and average biographies. Opened in 1989 and run on a nonprofit basis, the center also contains a gift shop selling books about blues, plus compact disc compilations of various regional musical styles. There's also a small performance space where septuagenarian blues pianist Mose Vinson, once a janitor at Sun Records, plays every Friday and Saturday while enthusiastically explaining the basics of his boogiewoogie style. Prior to World War II, the building was used mostly as a restaurant. Thomas Pappas operated one from around 1919 to 1940, usually under the workingsma's trademark, Joe's Lunch Room. In the summer of 1997 the new venue will called Elvis Presley's Memphis will open inside the renovated Lansky building. Now in 2014, Hard Rock Cafe is now located on this location. This club will be the first of several teemed nightclubs conceived by Elvis Presley Enterprises Entertainment in the world. It will be a two-story restaurant and bar with seating for about 300 people, and it will have a performance stage and small retail area, plus a wine cellar. Live musical entertainment will be the key of the atmosphere, along with a first rate menu from southern food will be served and top quality service. Mainstream blues, rock and roll and gospel will be a part of the musical mix, but the emphasis will be on classic and current rock and roll, performed by known and up-and-coming bands. Of course, Elvis Presley recordings and memorabilia on display, and specially produced Elvis videos will have a constant presence. The Blue Light Studio survived the decline of downtown Memphis. In the 1970s when Beale Street was abandoned, the studio simply moved a few blocks away to 145 South Main Street. In 1994 the Blue Light Studio moved again to 115 Union Avenue. Today one can still walk in to have a portrait taken, and one can still see the portraits of Elvis Presley. The site of Lansky's at 126 Beale Street is now occupied by Hard Rock Cafe Memphis nightclub and restaurant. The original location was on the northwest corner of Beale Street and Second street. Today the Blue Light Studio is on Union Avenue between Main Street and Second Street, west of the Peabody Hotel. Lansky Brothers today located on 149 Union Avenue, in the lobby of the luxurious Peabody Hotel, only a waddle away from the famous Peabody ducks. "Remember the excitement of the fifties? America was breaking away from the wholesome boy-next-door look in favor of ducktails, turned-up collars and bopping to sings like "That's All Right", Mystery Train" and "Blue Moon Of Kentucky". It was an era that changed the face of America - the world. Haven't you ever wanted to turn back the clock? Be cool again? Here's your chance. I've just created this limited collection of clothes for the young at heart, those who would like to go back to the freedom of the fifties when everybody, but everybody, was be-bopping to this evil music called rock and roll". In 1999 Bernard J. Lansky said, "I looked up one day and saw this young man looking at the display in the window of our menswear store on Beale Street in Memphis. I had seen him before. I knew enough about him to know he worked as an usher at Loew's State theater on Main Street, just around the corner. I didn't know his name. But, I get ahead of the story of how Lansky's became known as Clothier to the King". Actually, as my brother and I started out just after coming home from the Army in World War Two, we sold military surplus goods. The war was over. People were looking for inexpensive clothes. They could come into our shop and drop down fifty cents and walk out of there with a cap or something. For a dollar ninety-five, they could get a fatigue shirt or fatigue pants. All of this is a far cry from the reputation we were to build within the next decade on Beale Street". "When the surplus era began phasing out, we switched to high-fashion menswear and all the merchants up and down Beale, and around the corner on Main Street, were looking at us with raised eyebrows. High fashion? On Beale? Are you crazy or something?". "But we had seen a void in the Memphis market. Practically everyone was selling the same plain old things everyone else was selling. No one was selling really high fashion clothes. I mean, we carried nothing but the finest. That's what the kids of the late forties, early fifties wanted. And we gave it to them". "Now, back to that young man eyeballing the haberdashery in our window. I walked outside to greet him and told him, 'Come on in and let me show you around'. He said, 'I don't have any money. But when I get rich, I'm going to buy you out'. I had no idea what his name was, but I told him, 'Do me a favor, will you? Just buy from me. I don't want you buying me out'". "And that's how Elvis Presley began shopping at Lansky's and via our connection with Elvis and a flood of other well-known artists, that's how we earned the reputation of Clothier to the King. Elvis started out buying things in a pink and black combination. After his early records on the Sun label began making him a local hero, all the kids were swarming down to Lansky's on Beale because they wanted pink and black, just like Elvis wore". "We had everything they wanted. Black pants with pink shirts with big high collars; the row collars with the big sleeve; with three button sleeves; and with big sleeve cuffs. Something different. They were looking for something different, and we gave it to them". "We knew what this young man should be wearing when he went on stage, on television, things like that. We knew he should be wearing something different from what other entertainers were wearing. So we started him out with big shirts, peg pants, half-boots of patent leather. He would also come into the store and buy fly clothes. This was with the rolled up collars". "He would watch TV and see those gangsters wearing those big hats - we called them Dobbs hats. I think we sold them for twenty-five, thirty dollars. They would cost a hundred and a half today. Elvis would call and say, 'Mr. Lansky, send me over a half-dozen of them hats. And send some over for the other guys, too'. So everybody in the group - they later became known as the Memphis Mafie - got a hat". "Elvis was a dynamite young man. What he did for us... well, he was a great public relations man for us. Anybody asking him where he got his clothes, he would answer, 'I got them from Lansky's on Beale. Once he hit it really big, he came in more often and, no, he never bought me out. Every time he dropped by he wanted something different. We outfitted him for his appearances on the Louisiana Hayride. We outfitted him for the Ed Sullivan and Dorsey Brothers shows on TV. Knowing he was going on the Sullivan show, I sold him a coat with a velour collar. That was a real shock, that and his pegged pants and patent leather half-boots". "And despite how tremendously big he became - you know RCA/BMG has named him Artist Of The Century - he was the nicest ever want to Meet. It was always, 'Yes, sir, Mister Lansky'. And I would tell him, 'Mister Lansky is my father. I'm Bernard'. And that never changed. And when he came in on a shopping spree, if you happened to be in the store when he was there and you wanted something you liked, he'd buy it. He didn't care who it was or what it was. He bought it for them". "We sold to quite a few well-known entertainers: B.B. King, Jerry Lee Lewis, Johnny Cash, Carl Perkins, Rufus Thomas, Bobbie Blue Bland, Charlie Rich. For years Rufus would go on stage and show off his clothes and say, 'Ain't I clean? Lansky's. Rufus introduced Walking The Dog and Do The Funky Chicken to the world. When we went to the markets, we were always on the lookout for something different for Elvis, because Elvis would put them on and walk out on the streets and he was going to be our advertising, our billboard". "People would ask, 'Elvis, where are you buying your clothes'? And he would say 'Lansky's. We did a lot of mail order sales because of him. He was a real sharp dresser. Real neat. His clothes looked great on him. He was clean as Ajax. I mean, really nice. We would get new merchandise in and we would load it into a truck and I would have my son drive it out to Graceland for Elvis to look at. When the truck came back, it was empty. Elvis had taken all of it". "I still remember his size. At that time it was a 42 coat with a 32 waist, a size 10 1/2 boot. He wore a medium shirt - 15 1/2 by 34 shirt. We knew what Elvis concerts were like, filled with screaming women. When he first started throwing scarves into the audience, those were scarves we got for Elvis. When Elvis came into the shop, I would treat him like a baby. Put clothes on him. Stand him in front of a mirror. Marked his clothes (for alterations). And I would say, 'Elvis, this is what you want, right here. This is what I've got for you'. And he would start laughing, and then buy it". "He walked into the sore one day and said, 'Come look what I've got'. Outside, he showed me a German Messerschmidt car, saying it had been given to him by RCA Victor, his record label then. I said, 'Elvis, that's a nice one. When you get tired of it, I want it. That's mine. He laughed. And thirty days later he gave me the car. I still have it". "And I still have all those wonderful memories of when Elvis was a Number One customer and a Number One walking billboard for Lansky's, which soon became known as the Clothier to the King". In 1981, Bernard Lansky bought out his brother, and he and his son Hal Lansky opened a bigand-tall business. It grew to 11 Lansky Big and Tall stores and Hercules stores in the Mid- South. In 1994, they sold for a nice profit. In 2001, Lansky's established a new line of clothing entitled "Clothier To The King," which provides reproductions of clothing that Elvis actually wore combined with new 1950s-inspired clothing. Lansky Brothers has since moved its location from Beale Street to Memphis' renowned Peabody Hotel, but is still as busy as ever. Bernard Lansky remains an ideal figure of Memphis history. Musicians that currently shop there include Elvis Presley made it famous for the likes of The Jonas Brothers, Robert Plant, Eddie Floyd, Stephen Stills, Steven Tyler, Dr. John, Gavin DeGraw, and numerous others. On Sunday August 14, 2011, Lansky Bros. will unveil a historical marker located at 126 Beale Street to celebrate the history of Lansky Bros. at the original location. Guy Garret Lansky died on January 6, 2005 of complications from Alzheimer's disease at his Jewish home in Memphis, Tennessee, at the age of 83. His brother and storyteller, and most notably, Clothier to the King, Bernard Joseph Lansky passed away peacefully at the age of 85 on November 15, 2012 at his home in Memphis, Tennessee.